The above quote is taken from the book “Niagara’s Ghosts at Fort George” by Kyle Upton - self published ISBN 0-9685150-0-2. And if anybody would know it should be Kyle Upton as he is a long-time staff member and manager of the “Ghost Tours” held at the fort. We highly recommend these tours to all visiting ghost enthusiasts - you will not be disappointed! The location is in fact rich in tales of ghost encounters, possible PSI phenomena, anomalous light activity, and even UFO reports! This page will cover our investigation of this “hotspot” of suspected paranormal activity. For detailed information regarding witnessed ghost and haunting activity please refer to the above mentioned book or The Toronto Ghosts & Hauntings Research Society. 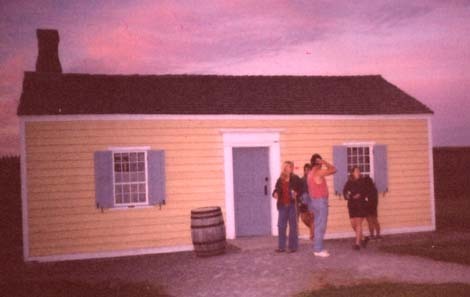 Since 2000 our organization has made several trips to Fort George and through our colleagues at the TGHRS have been fortunate enough to collaborate on three separate investigations of this historic site. However, we will be the first to admit that more study is needed and definitely warranted! Our members have reported, both visual and auditory anomalies. The most interesting of these include an experience that occurred to both the writer of this article and an onsite staff member whom was providing security during our visit of June 15th, 2002. The staff member and myself were investigating a report of possible anomalous sounds emanating from Blockhouse #2. We were positioned in the upstairs portion of the building approximately 6-10 ft. apart when I felt what can only be described as something brushing past me. It was as if someone/thing pushed past me, yet no one else was in the room with the exception of the two of us. Odd! For a few seconds immediately afterwards I also felt disoriented with the only words I can use to describe the feeling that overcame me as being highly disturbing. Within a few seconds I heard a deep intake of breath coming from my companion. I asked him if he was okay and he proceeded to tell me that he had just experienced a similar reaction to what he also perceived as someone/thing walking by. He went on to further state that he saw what appeared to be a leg exit through the doorway that we were standing near. The timing between our experiences could be construed as the timing needed for someone to walk the length between us. Pure speculation - of course. This entire episode was caught on tape by the camcorder I was holding. Review of the tape by Matthew Didier Director of the GHRS and I showed no visual anomalies. However, it is of interest as it does capture the reactions of both myself and the staff member to possible paranormal stimulus! To view the video clip please click here. Of further interest is that this particular building is proclaimed the “most haunted” site in Kyle’s book - see page 21. 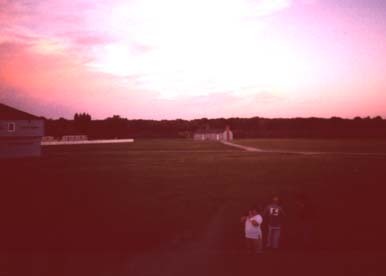 It is also the scene of a similar episode reported by a sensitive and a handful of others during the TGHRS June 2001 road trip. You may be wondering at this point about the strange sounds that we were initially investigating. In this case Matt Didier, Lisa Reid and myself were able to determine these to be a poor creature of some sorts (skunk, raccoon) that had become trapped within the heating ducts of the building. I find it ironic that it was the initial investigation of these identifiable sounds that led to the unusual experience detailed above. In all honesty I can say I have never felt as an uncomfortable and unusual occurrence such as this before! During our investigation of the fort conducted on May 17th 2002 we were fortunate in that we were able to conduct EMF (electro-magnetic field) experiments in the company of a sensitive. This is part of an ongoing study of EMF and purportedly haunted locations. In this component we are using a sampling of 12 “sensitives/psychics” and comparing EMF readings using an EMF detector and comparing them to reports of possible “ghost” activity made by these individuals. Our findings will eventually be published within a paper that tests the hypothesis that paranormal activity results in unexplainable and significant elevations of EMF readings. To date all attempts at photographs, EVPs, and video recording prove inconclusive at best and otherwise have yielded nothing unusual in our opinion. However, we fully intend to visit this location again and anything of interest will be added to this site. For further information on Fort George please visit the Friends Of Fort George website. Contact information/directions to the fort are kindly provided there.